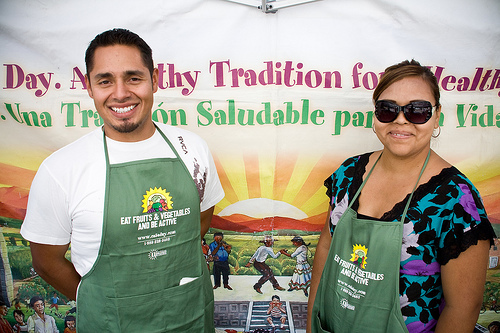 Joey Ayala and Ana Luciano, staff for Orange County Regional Network’s Latino Campaign, use games and other materials to provide parents and other local residents with healthy eating tips at the Fruit & Veggie Festival. Held outside the Northgate Market, a key grocery store in Santa Ana, the event is part of the Orange County Regional Network’s effort to engage businesses, schools, residents and healthcare professionals to influence community eating and exercise habits. Their work concentrates particularly on low-income and Latino communities, who are prone to higher rates of obesity and diabetes.